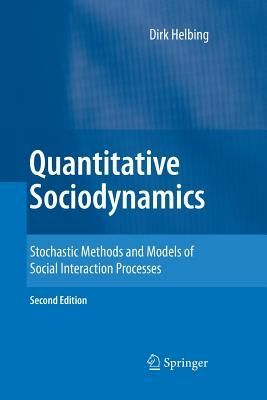 When I wrote the book Quantitative Sociodynamics, it was an early attempt to make methods from statistical physics and complex systems theory fruitful for the modeling and understanding of social phenomena. Unfortunately, the ?rst edition appeared at a quite prohibitive price. This was one reason to make these chapters available again by a new edition. The other reason is that, in the meantime, many of the methods discussed in this book are more and more used in a variety of different ?elds. Among the ideas worked out in this book are: 1 a statistical theory of binary social interactions, a mathematical formulation of social ?eld theory, which is the basis of social 2 force models, a microscopic foundation of evolutionary game theory, based on what is known today as proportional imitation rule, a stochastic treatment of interactions in evolutionary game theory, and a model for the self-organization of behavioral 3 conventions in a coordination game. It, therefore, appeared reasonable to make this book available again, but at a more affordable price. To keep its original character, the translation of this book, which 1 D. Helbing, Interrelations between stochastic equations for systems with pair interactions. Ph- icaA 181, 29 52 (1992); D. Helbing, Boltzmann-like and Boltzmann-Fokker-Planck equations as a foundation of behavioral models. PhysicaA 196, 546 573 (1993). 2 D. Helbing, Boltzmann-like and Boltzmann-Fokker-Planck equations as a foundation of beh- ioral models. PhysicaA 196, 546 573 (1993); D.